We need to green our chemical footprint by addressing the crisis of environment with the crisis of livelihood and the disproportionate way poor people carry the burden of industrial pollution at the same time. Every important non-carbon industry economist agrees there is a new industrial revolution already taking place in energy – the fastest growing sector of the U.S. economy now is in windmills. The Chinese have thrown hundreds of billions of dollars at solar and other green energy manufacture. The new prosperity that creating a sustainable economy would bring, on the chemical as well as the energy fronts – would result in just those “good green jobs” we need. This way lies a livable 21st century. But we must be equally creative and pro-active on the chemical front too. The goal in a sentence: radically green our chemical footprint by regulating and banning harmful chemicals and substituting benign ones, which we can often do; or by substituting different ways of doing things, for example, organic farming, for chemical pesticide-dependent farming. You don’t need to take my word for it, there’s so much information available today. 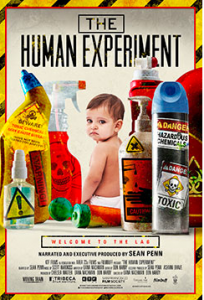 One quick way to get an overview is to watch the documentary film, The Human Experiment, produced and narrated by Sean Penn. 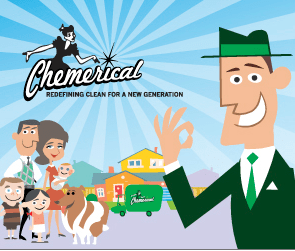 Viewing Chemerical,, a trip through the toxic chemicals in most people’s homes by filmmaker Andrew Nisker, is also an eye-opener. You may want to get reading after that, or maybe you’re ready to leap in now. 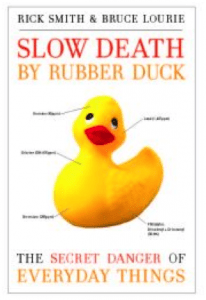 If you’re new to the issue, two very accessible books you may want to check out are The Body Toxic: How the Hazardous Chemistry of Everyday Things Threatens Our Health and Well-being by Nena Baker and the very engaging and informative Slow Death by Rubber Duck: How the Toxic Chemistry of Everyday Life Affects Our Health by Rick Smith and Bruce Lourie. To do this we – and in the first instance, our elected representatives who guide the various ships of state – have to change thinking, shift paradigms, look at the world in a different way. These twinned objectives – livelihood and environment – must inform how economic development is pursued, how laws and public policy are formulated – absolutely on chemical manufacture and use – on how to build infrastructure and use incentives and disincentives in subsidies, how to understand and act to protect public health, in how to educate for and practice medicine and provide health care. How do we do green our chemical footprint? By addressing the twin crisis of environment and livelihood – the other great crisis of our time – together. Because climate change and ocean destruction are proceeding at such dangerous speed, emergency measures to save the envelope of life that is our biosphere must be taken very soon. To that end, I recommend that every single person learn about and support in every way possible the Half Earth project, which seeks to set aside 50 per cent of the planet’s surface for nature and wildlife. The idea is that without this much, the ecosystem of the biosphere will collapse, and we will find ourselves without oxygen and the conditions to sustain ourselves. Then, we need to make some massive paradigm shifts in human life, too. Every important non-carbon industry-affiliated economist agrees there is a new industrial revolution already taking place in energy – the fastest growing sector of the U.S. economy now is in windmills. The Chinese have thrown hundreds of billions of dollars at solar and other green energy manufacture, and sustainable energy is the economic wave of the future. The new prosperity that creating a sustainable economy would bring, on the chemical as well as the energy fronts – must now come just as sharply into focus. This, too, would result in those “good green jobs” we need. This way lies a livable 21st century. In the years of the Great Depression, the United States adopted the New Deal – an overarching, multi-faceted plan to mobilize the power of government, through the taxation and distribution powers of government, to build critical infrastructure, support enterprise and promote social projects and services that would cohere, support and revive American society and the American economy. Many other countries took this Keynsian approach too. People ask all the time, “but do we have the technology?” And the answer to that is, YES. Drop in and visit these websites, see how far we’ve come, see who’s doing the work, and see who’s coming on board. Today, we need the same overarching vision and mobilization; but today, it needs to turn toward environment as well as jobs. Former Vice President Al Gore has proposed a Global Marshall Plan, so the global North can assist the global South to transition to clean energy. And we are beginning to move in the right direction on climate change – through programs based in what people are now calling “climate justice”. But we need a transformation, on more than energy, we need it on chemisty too – and toxics clean-up and ocean plastics rescue and other pressing matters related to chemicals. We’re still a century behind on policies that seek to green our chemical footprint, and integrate both energy and chemistry, while ensuring that those who work in brown industries are support in their transition to green. The upshot is we need a Green Deal. Check out the sidebar to see its component parts. So, since the conception of this multifaceted, pro-active, redistributive approach must, by definition, precede its execution, all of us as citizens and as those seeking public office office need to understand the issues involved in greening our chemistry – the science, the medicine, the economics, the politics, and the alternatives. It can be done. Click here to see ten examples of companies doing it today! And read on for many resources, from websites to scholarly books, to help you believe it too. Because there’s so much to read – studies, reports, articles, books, journalism in so many venues – what I’ve done here is to create an idiosyncratic collection of references that I have found extremely useful. And I’ve divided this information into three sections. Please be sure to scroll down for the second and third sections – they’re well below the fold. 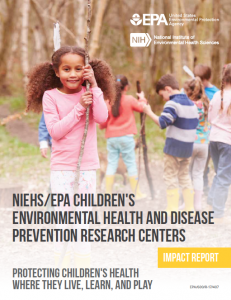 Hot off the press – The stunning new NIEHS/EPA Children’s Environmental Health and Disease Prevention Centers Impact Report: Protecting children’s health where they live, learn, and play, the EPA report on the impacts of industrial and consumer chemicals on children’s health, that links everyday exposures to bisphenol A (a plasticizer found in myriad goods), flame retardants (in our furniture, bedding, clothing) and in pesticides (in our food chain, golf courses, gardens and homes) with asthma, poor b​irth outcomes, ​cancer, and brain and behavioural problems​, immune dysfunction, autism spectrum disorder and obesity​. The report ​estimates the cost of environmentally related diseases in children at $76 billion a year. Read about it at and download it here. 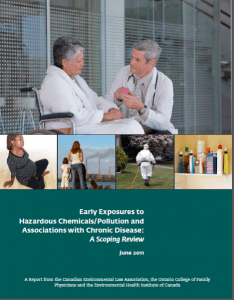 An important 2011 study – Early Exposures to Hazardous Chemicals/Pollution and Chronic Disease: A Scoping Review, A Report from the Canadian Environmental Law Association, the Ontario College of Family Physicians and the Environmental Health Institute of Canada, is also powerful, especially when combined with the EPA’s new report. 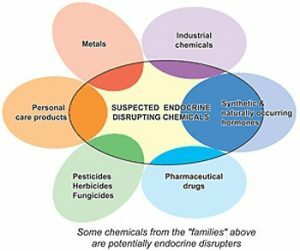 This was an important piece because it showed how extensively, by 2011, correlations had been made by researchers among between certain classes of chemicals in everyday products and certain types of diseases and disorders. Also new, and so important – The chemical disruption of human metabolism. Stephen J. Genuis, M.D., & Edmond Kyrillos (2017) http://dx.doi.org/10.1080/15376516.2017.1323986. 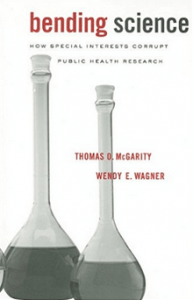 Toxicology Mechanisms and Methods, ISSN: 1537-6516 (Print) 1537-6524 (Online) http://www.tandfonline.com/loi/itxm20 DOI: 10.1080/15376516.2017.1323986. Living Downstream: An Ecologist Looks at Cancer and the Environment. Sandra Steingraber.Addison-Wesley. Reading, MA 1997. 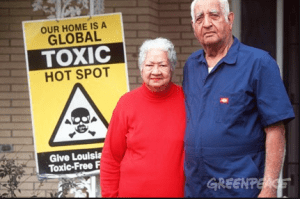 Amputated Lives: Coping with Chemical Sensitivities – Exxon Valdez Cleanup, Gulf War, World Trade Center Attack, Hurricane Katrina. Alison Johnson. Cumberland Press. Brunswick, ME 2009. Deceit and Denial: The Deadly Politics of Industrial Pollution. Gerald Markowitiz and David Rosner. Milbank/Uninversity of California Press. Berkeley 2003 and 2013. 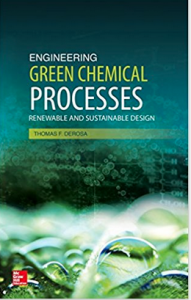 Engineering Green Chemical Processes. Thomas F. DeRosa, Ph.D. McGraw-Hill Education. 2014. Green Chemistry: Theory and Practice. By Paul T. Anastas and John C. Warner, University Press. 2000. 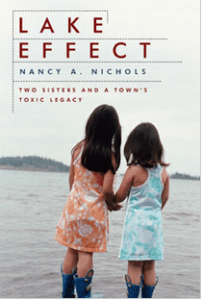 Lake Effect: Two Sisters and a Town’s Toxic Legacy. Nancy A. Nichols. Shearwater Books/The Center for Resource Economics. Washington D.C. 2008. 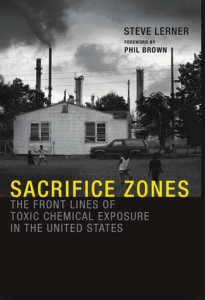 Sacrifice Zones: The Front Lines of Toxic Chemical Exposure In The United States. Steve Lerner. Foreword by Phil Brown. MIT Press. Cambridge, MA 2012. Out of the Wreckage: A New Politics for an Age of Crisis. George Monbiot. Verso Books. London, 2017. You will want to learn about and build support for the new campaign that seeks to set aside “half the earth for the rest of life.” It’s simple: the biosphere is an ecosystem; if large parts of it collapse, all of it will collapse. Setting aside half of Earth for wildlife and their habitats is the proposal that speaks best to saving oceans, rainforests, coral reefs, glaciers – those places in the world we need in order for humanity to live too. And the mission could not be more urgent. Visit the website to learn more at http://www.half-earthproject.org/. 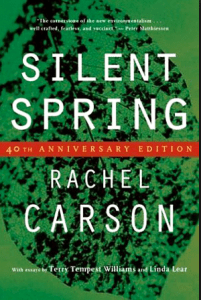 Fusing the approaches of the New Deal with Environmentalism, creating a new economy with dignified work for all while reducing our carbon, water and chemical footprint. Create a new economy with dignified work for all while reducing our carbon, water and chemical footprint. Right now we are truly facing twin, inter-impacting crises: catastrophic environmental threats in climate change and chemically-linked health decline, on the one hand; and growing economic distress for the majority of people in the sucking out of wealth by the top layers, past and future job loss to automation and to low wage jurisdictions, the rise of precarious work as the new normal, the eroding of social supports of all kinds, the scattering and breaking of families, the decline of the middle and working classes, and the lack of economic incentives sufficient to green our economy in a race against time and greater disaster. We have the technologies, but we lack the instruments of political will. In fact, only governments have the economic resources, the legislative clout and societal reach to solve a crisis as deep and wide as this, a crisis that demands a societal mobilization as great as if we were at war. In the 1930s President Franklin Delano Roosevelt saved the United States from a suicidal death-dive by crafting the New Deal, a coherent series of federal programs that redistributed wealth to needful goals and social supports; funded massive public work projects that built infrastructure (including energy) for the coming century and employed people at a living wage, and created sweeping financial reforms and regulations to prevent another Great Depression. Today, we need the same broad approach, but crafted specfically for our time. We need a Green Deal. 1. Build political parties committed to the public interest, capable of strategizing a Green Deal approach on multiple fronts, and of governing pro-actively and comprehensively to implement this program; and build them at all levels. Work to expand and enhance awareness of fellow citizens and their commitment to vote. Again: becoming involved in politics in order to make them green and equitable has become the highest calling for environmentalists. 2. Elect national governments pledged to the Green Deal approach, that will re-set their policies, programs, reforms and laws and distribute funding to states, provinces, and cities along the policy objectives of the Green Deal. Elect state/provincial and municipal governments that seek to create a Green Deal approach at whatever scale they are able. 3. Use government spending power to purchase green-only products and use it aggressively to create new markets and a competitive edge for green commerce/ create healthy work and study conditions and good green jobs. From the food served in government and government-funded facilities such as schools and hospitals and military bases; to the products used (be they office or medical or building supplies, cleaning materials, all manner of equipment)— all government funded services and agencies should use only products that pass the ‘green production and safer chemicals’ litmus test.This measure alone would constitute a benign but massive market intervention, and shift practices in many sectors in which economies of scale are important to shifting to green practices. 4. “Green Trade,” not “Free Trade”: renegotiate international trade agreements to include standards that create healthy imports and off-shore jobs, and good green jobs away and at home: “Free trade” was always an Orwellian misnomer, that, in fact, undermined the environmental sovereignty of its signees, as well as permitted the draining of jobs to the lowest wage jurisdictions, both continentally and globally. Greening international trade agreements— setting standards on the energy use, component materials, mandatory labeling, waste creation and disposal of goods— with serious carrots and sticks (taxes and tariffs) will force countries to ensure their goods are safe, and should be paired with agreements to raise wages in manufactured traded goods (“harmonize upward”). 5. Green the energy infrastructure at home with sustainable technologies and end all carbon subsidies, slow climate change, implement environmental justice, and create good green jobs. End all formal and informal subsidies to the carbon sector; massively subsidize green energy industries to create sustainable infrastructure and energy on the condition of good wages; effect legislative reform to make all this possible; create capacious and adequate transition funds and pro-active, nation-wide programs, administered locally, to ensure all carbon sector workers are retrained and re-employed in other jobs, again, with good wages. Stop new oil, gas and coal exploration, especially in fragile ecosystems; make the energy revolution at home. 6. Green the chemical industry and use of its products, implement environmental justice, create safe consumer goods and good green jobs. Laws governing chemical manufacture and disposal, minimally on the European R.E.A.C.H. standards are needed as a base-line for policy and law. With this, a system of standards, mandatory labeling, penalties and incentives needs to be crafted, and enforced. This will mean a shift from petroleum based, endocrine-disrupting, ocean-destroying materials such as today’s plastics to products based more on plant and mineral sources. Implement a wide-ranging program of environmental justice for fence line communities tied to the petrochemical industry, including laws about permissible distances for housing and subsidies to move and to seek work in other industries. 7. Green Agriculture, go chemical-free, restore soil, use water wisely, slow climate change, create healthy farming conditions, healthy food and good green jobs. 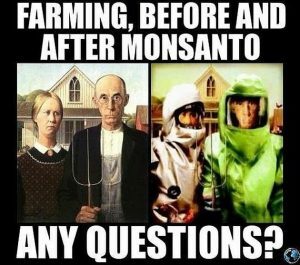 Institute a set of programs, policies and reforms to enable farmers of all sizes to stop hurting the land, themselves and their workers with harsh chemical fertilizers and deadly pesticides. Institute economic incentives and capacious transition funds to permit the shift to organic agriculture, to amends vast tracts of pesticide-laced, chemically-fertilized, depleted soil. Organic methods produce healthier food and healthier farmers, over a five-year period surpass the yields of chemically-based farming, produce one-third less greenhouse gases, and turn organic fields into carbon sinks—actually absorbing greenhouse gases and reducing global warming threats. 8. Green the financial sector: create transitional funds and prevent continued investment in deadly commerce. Institute ‘Robin Hood’ taxes— very small, transactional charges that yield billions—on financial transactions, and create funding pools for green economy purposes. Tax chemical toxics as well as carbon production, at levels high enough to repel capital and create counterincentives to invest in green ventures. Regulate the size and activities of banks and insurance companies in ways aligned with the Green Deal objectives. Raise taxes on the wealthy, on and off-shore; reduce taxes on the working and middle classes to fund the transition. 9. Green your city-state-province-nation-oceans/Create good green jobs. Legislate and enforce laws against harmful waste disposal, create serious new enforcement laws and agencies, and fund massive programs of cleanup and reclamation wherever these are needed. Trained workers, good wages: good green jobs. 10. Green health and social services/help victims of climate change disaster and chemical injury, make environmental health costs transparent, restore people and families to productivity and create good green jobs. Health care needs a ‘environmental health overhaul’— parts of which are described in the side bars here and here—to rise to adequacy in the 21st century. Invest in research, in health provider education, in mandating and funding public health, in delivering services; oblige health insurers to cover the costs. This too will help those in need and create good green jobs. Jonathan R Latham, PhD is co-founder and Executive Director of the Bioscience Resource Project and the Editor of Independent Science News. Dr. Latham holds a Masters degree in Crop Genetics and a PhD in Virology. He was subsequently a postdoctoral research associate in the Department of Genetics, University of Wisconsin, Madison. He has published scientific papers in disciplines as diverse as plant ecology, plant virology, genetics and genetic engineering. Dr Latham is also the Director of the Poison Papers project which publicizes documents of the chemical industry and its regulators. Why ban classes of chemicals? 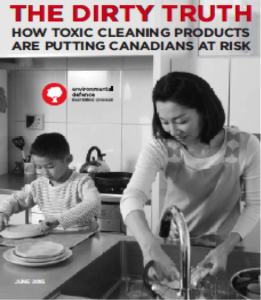 Anti toxics advocates have been confronted with nearly 100,000 new chemicals and no clear path to how to deal with their staggeringly destructive effects on humans and on our environment. Many countries – including the U.S. And Canada – and many government agencies have based their various chemical management schemes – laws, regulations, norms – on “single chemical evaluations,” an approach that is flawed scientifically, and guaranteed to fail on many fronts. Not least of these is the amount of time needed to effect such an approach. A “management process” that would take a hundred plus years to implement is – does this actually need saying? – the wrong way to go. The alternative? Get to know the BioScience Resource Project and the views of its Executive Director Jonathan Latham, Ph.D. because he proposes a different approach, based on banning classes of chemicals. A longer article that gives more detail about the scientific flaws in the “single chemical approach” is also available, in full below the short article that follows here, for readers who want to know more about the science involved and the thinking behind the “ban classes of chemicals” approach, the one I support. That this approach is more scientifically sound than other approaches of course recommends it highly. That it is the only realistic approach with a snowball’s chance in hell of making a big enough difference to time to stop the toxic onslaught, recommends it even more. In Dr. Latham’s first article below, I’ve bolded the sections that speak to actions most directly. Read and learn; then, by all means if you’re interested, read some more. To be updated soon, please check back later!